Get ready for a marathon on great food! We’re tackling Ratatouille! We watched the video and noted all the food shown that we noticed. There were ~25 actual recipes that we haven’t made before. This week we’re doing the food up until Remy gets washed up in the sewers of Paris. With Ratatouille, we’ve been trying not to cut any corners because we want to make the food as realistic as possible. So check out Week 1 below! This week we got some help with our friends at Fiction-food Cafe for one of the recipes. So check out that site for some great treats! Also, support us on Patreon (http://www.patreon.com/disneymeals) for some great perks like early access to recipes and recipe cards. Also, it is a great way to help us afford this great project. Thanks! This first recipe is at the start of the movie where they explain who Gusteau is though a series of images. One image is him on a cover of a magazine holding a plate with a salmon fillet on top of a caesar salad. 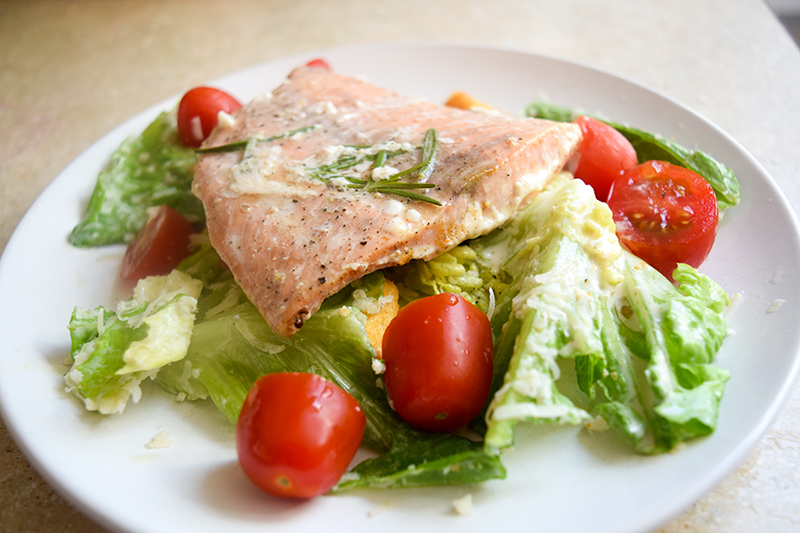 Place the butter and half the herb in a roasting pan just large enough to fit the salmon and place it in the oven. Heat about 5 minutes, until the butter melts and the herb begins to sizzle. Add the salmon to the pan, skin side up. Sprinkle with salt and pepper and turn the fillet over. Sprinkle with salt and pepper again. Roast 3 to 5 minutes more, depending on the thickness of the fillet and the degree of doneness you prefer. Mix all the dressing ingredients in a food processor and blend together. Remy finds this discarded Mille-Feuille (or Napoleon) in the trash. He samples it and notices it has a hint of lemon. This was a slight challenge to make.. It turned out too tall and I destroyed it when I went to cut it, but MAN was it good. Place a pan of the same size on the puff pastry covered with parchment paper. The second pan should prevent the puff pastry from rising too much, but it should not be too heavy. You can use the oven grill as well. Bake again for 30 minutes. Remove from the oven and set the oven temperature to 260°C with the grill mode on. Remove the second pan and the parchment paper and then sprinkle the puff pastry with powdered sugar. Bake for 5 more minutes (keep an eye on the puff pastry as it might burn very easily). As soon as you take the pan out of the oven, cut the puff pastry rectangle in 3 equal bands (the smaller side of the rectangle should become the long side of the bands). Allow the pastry cream to boil for 2 minutes then remove from the heat. Pour the cream on a pan covered with plastic wrap, cover with more plastic wrap and chill. Finally add the third and last band of puff pastry (flat side on top) and chill the millefeuille. In the meantime melt the chocolate and have it ready in a parchment paper piping cone. Now heat the fondant with half a spoon of water on a bain marie. The fondant should be quite runny, but do not overheat it (the ideal temperature is 35-37°C). Cut the tip of the piping cone and quickly draw multiple chocolate lines on the fondant before it dries completely. You can aim for perfection, but even if the lines are not perfectly straight, don't worry too much, (almost) nobody will notice! 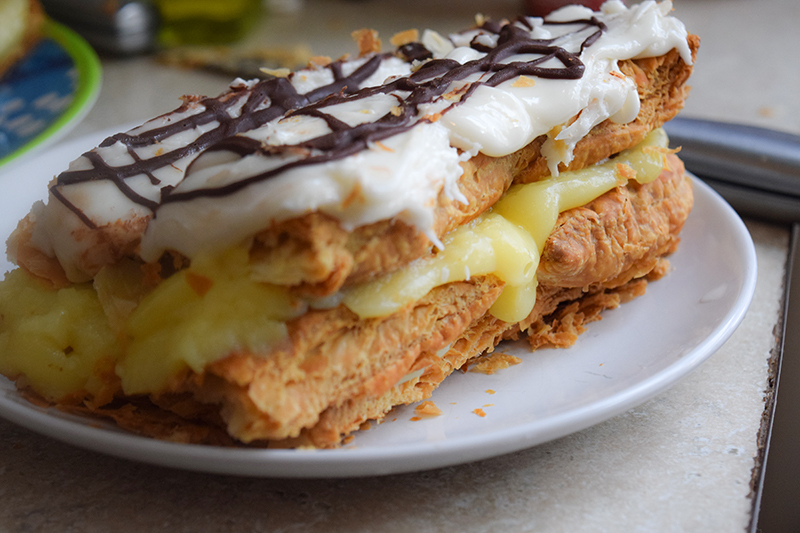 Chill the millefeuille for at least a couple of hours (or freeze it for 20-30 minutes), then refine its edges by cutting a few millimetres per side with a serrated knife to make them straight. Remy finds a Chanterelle mushroom and some Chèvre. He starts to roast them with some seasonings and then was struck by lightning, creating a blast of flavor. This is where our friend at Fiction-Food Cafe came in. She had a great recipe on her site. It turned out marvelously. I did make one slight tweak to it. I added a little bit of liquid smoke to imitate the smokiness created from roasting it over the chimney. We also couldn’t find any chanterelle mushrooms, sadly. Here’s the recipe on Fiction Food Cafe, or you can just check out the video and recipe below. Heat your oven to 425ºF. In a small pot over medium heat, cook the oil & rosemary sprigs until the sprigs are crispy. Remove the sprigs to a paper towel & discard or eat. Rinse, pat dry, & remove the stems of the mushrooms. Place the mushrooms in the pot and add a dash of liquid smoke. Roll the mushrooms around in the pot of oil using tongs or a spoon until the outsides are completely coated & then place the mushrooms on a baking tray, bottoms up. In a small bowl, mix the chèvre, honey, salt, chopped rosemary, & optional saffron bits until well combined. Equally distribute the mixture between the mushrooms, gently pressing it to make it more compact. Slide the tray into the oven & bake for 10-15 minutes or until the chèvre mixture develops golden spots. Broil for ~1 minute longer to get golden brown spots. Remove from oven & let cool for a few minutes, until warm. 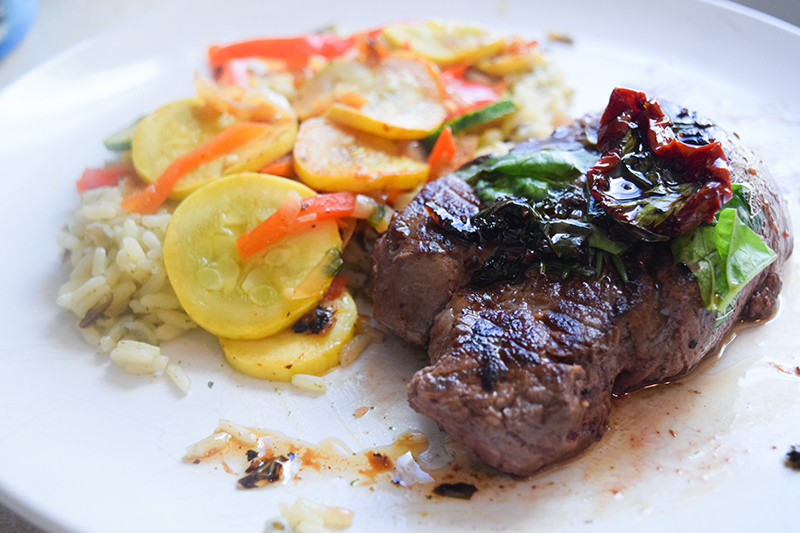 Garnish with short sprigs of fresh rosemary. Revel in the flavor sensation. This was one of the hardest dishes to identify. It is the dish Ego eats on TV before taking away a star from Gusteau’s Restaurant. I decided it was a Seared Beef with Wild Rice and veggies. Turn to low, cover and cook until rice is tender. Add the onions and garlic until the onions are translucent. Combine the olive oil, vinegar, a bit of juice from sun-roasted tomatoes and garlic. Set aside. This recipe is special because it comes straight from the movie. I copied the recipe as it shows in the screenshot. There were some words in the steps I had to guess at because I couldn’t make out what it said. Turns out the recipe worked! It wasn’t just some random fake recipe. I did have to cook it for almost twice as long as it says though. 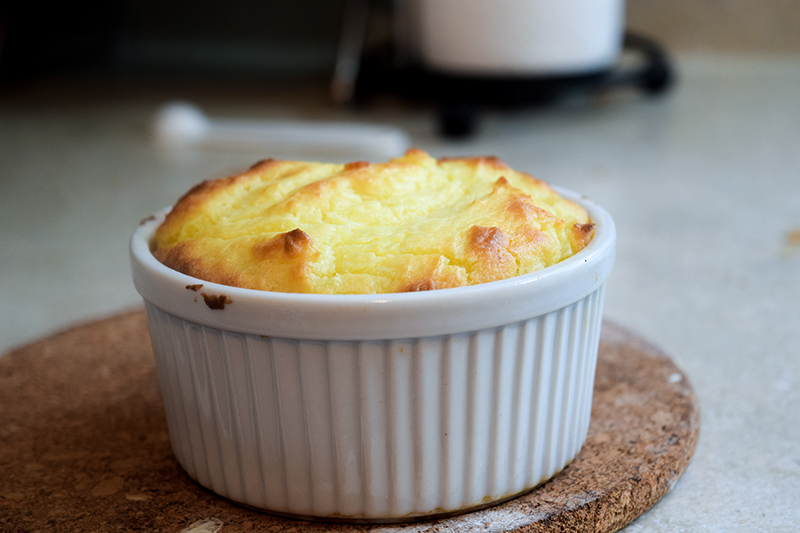 So without further ado, here is the OFFICIAL Gusteau’s Souffle (the words in the brackets are the instructions I couldn’t make out and guessed). Bring to a boil while stirring constantly. Once the mixture has [thickened] transfer to a [rack[ to cool. Fill prepared molds ¾ way [full]. Bake at 400F for 20 minutes. Serve immediately. Will it show you that Anyone Can Cook? All of the food was super tasty. 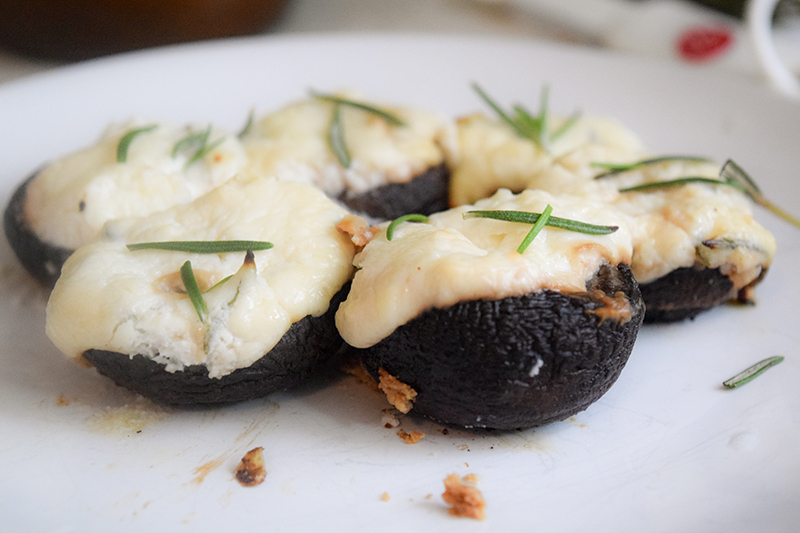 I was surprised at how good the lightningy mushrooms were. They really packed a punch. The souffle came out great too! Thanks! I just checked out your blog (I’m assuming its http://nerdytreats.dk/ ). You have some great stuff there too! I love your Futurama recipes! haha. The salmon was really good. At first I was just going to put it on a bed of plain lettuce, but I talked to a chef before doing these Ratatouille dishes and he recommended to do it on top of caesar salad. It tasted great! I can hardly wait for the other recipes. These look great!